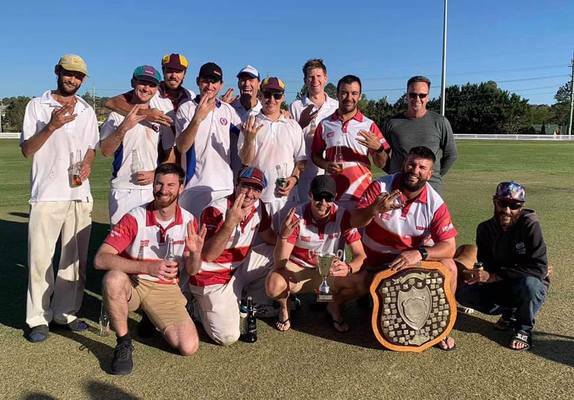 Valleys had plenty of time to celebrate their 2019 Premiership win after passing the required total in just 12 overs in the rain delayed Grand Final. Schedule a cricket grand final during a drought and you can nearly be assured it will rain or so it seems in Stanthorpe. On Saturday the heavens finally opened and while there was no-one complaining it did play havoc with the Stanthorpe Cricket Grand final. As we all marvelled at the rain tumbling down, the Stanthorpe cricket grand final between RSL and Valleys was postponed until Sunday. Unfortunately, during one of the heaviest downpours on Saturday the wicket got wet when the covers blew off. Conditions on Sunday were much improved however it was almost a given that the CF White wicket was going to play some tricks. It was no surprise when Valleys captain Damien Martin won the all-important toss that he asked the Minor Premiers, RSL to bat first. The Valleys strong bowling attack revelled in the conditions and dominated the experienced RSL batting line up from the start of the innings. The opening partnership of Sam Dowie and Jason Lawer struggled to put runs on the board. When Steve Martin dismissed the normally dangerous Dowie for just eight runs in the fifth over it opened the flood gates and wickets tumbled. The RSL scorecard read like a cricket horror story with four duck eggs and only score of double figures. The Valley’s bowlers on the other hand revelled in the conditions. Cameron Crestani took to a match winning five wickets for just 14 runs in eight overs. His figures included 4/0. He was well supported by the remainder of the bowling group. Steve Martin and Sandro Stefanon each claimed three wickets and Captain Damien Anderson captured the wicket of the opposing captain Jason Lawer and tail-ender Chris Duff. RSL were dismissed in the 30th over for just 45. The total of 45 should have been a doddle to chase down for Valleys but on a nasty wicket runs have to be earned. However, on the drying CF White wicket the RSL bowlers failed to have the dominance we seen in the first innings and Valleys strolled to a very comfortable win in just the 12th over losing just one more wicket on the way to lifting the premiership trophy for the second time in four years. Cameron Crestani was named player of the final after his impressive stint with the ball set up Valley’s win. Jason Lawer acknowledged the excellent performance of the Valley’s attack but said his side may also have paid the price for not having played a game in the final month of the competition.